The UGS’s Martha Hayden, Don DeBlieux, and Jim Kirkland with their complimentary copies of the volume. Following the 1996 establishment of the Grand Staircase–Escalante National Monument (GSENM), paleontological research in this largely unstudied region of the nation accelerated at a remarkable pace, thanks to an infusion of research dollars from the federal government. Much of this research centered on the Upper Cretaceous of the Kaiparowits Plateau, which is at the center of the most continuous belt of terrestrial Cretaceous rocks anywhere in North America. The Utah Geological Survey was in the thick of it with early general survey projects and the later, more focused, Wahweap Project in the southern Kaiparowits Plateau from 2001–2005, which resulted in the discovery of Diabloceratops eatoni. Additionally, significant funded projects were undertaken by the Museum of Northern Arizona and the Natural History Museum of Utah (NHMU). The results of this burst of scientific exploration has now been summarized in the massive volume “At the Top of the Grand Staircase: The Late Cretaceous of Southern Utah,” edited by the Alan L. Titus (GSENM) and Mark Loewen (NHMU), published just this past month by Indiana University Press. The 634-page book includes 28 chapters, starting with papers on the geology and sedimentology of the regions, followed by papers on the fossil plants, invertebrates, fish, amphibians, turtles, lizards, crocodilians, marine reptiles, and chapters on each major group of dinosaurs. 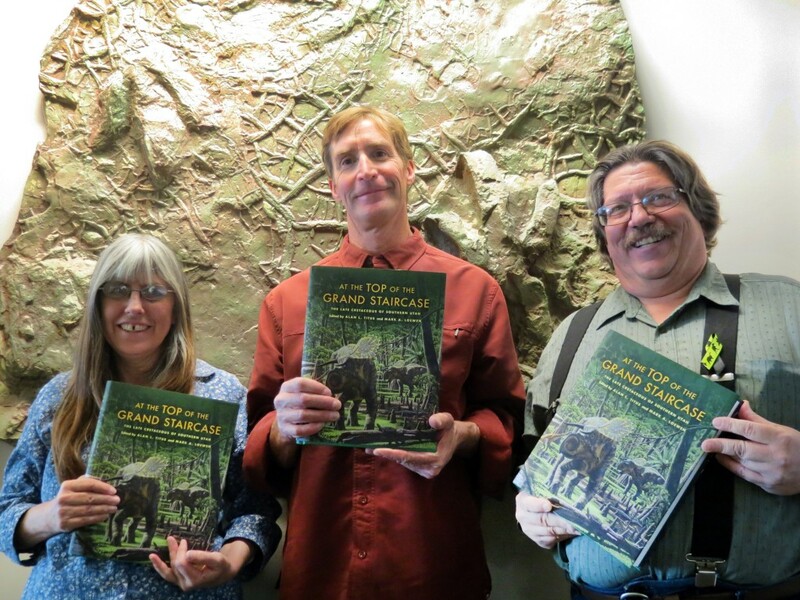 The UGS’s Jim Kirkland, Don DeBlieux, and Martha Hayden just received their complimentary copies of the volume for their contributions and will be spending the rest of the year looking over this magnificent contribution to our knowledge of Utah’s geological and paleontological record. POTD October 4, 2013: Lost Canyon, Needles District, Canyonlands National Park, San Juan County, Utah. Green River’s John Wesley Powell Museum traces history of Utah rivers POTD November 7, 2013: Coral Pink Sand Dunes State Park, Kane County, Utah.